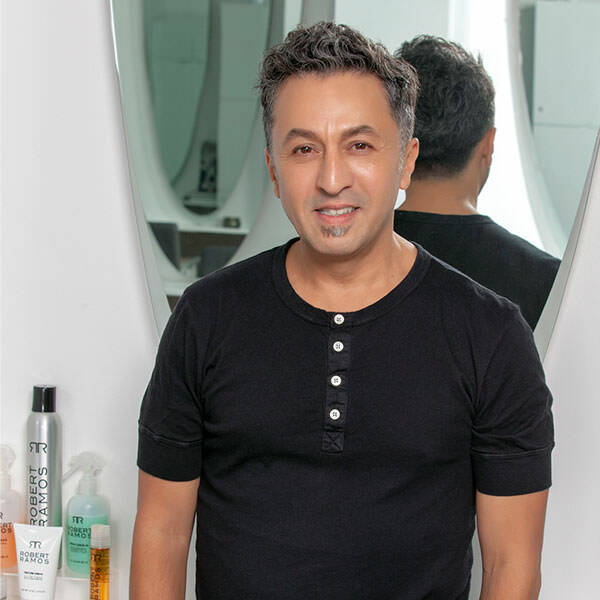 Robert Ramos is An Emmy-nominated hair stylist, he has been one of the creative forces behind the legendary Estilo Salon for 28 years, frequented by celebrities and LA’s elite in all realms of entertainment and business. His esteemed career has allowed him to travel the world with his clients. Robert has a loyal clientele including Jessica Alba, Melissa McCarthy, Bette Midler, Eva Mendes, Nick Jonas, Stevie Nicks, and Kelly Clarkson to name just a few. In October 2017, Robert along with Philip rebranded the new, ultra beautiful and modern salon in their namesake Ramos Carreon Salon. Robert is highly sought-after as a freelance hair stylist for editorials, advertising, television and film. Robert and his work have been published in Vogue, Elle, Glamour, Esquire, Rolling Stone, and People, among others. Many of these publications have written articles about Robert or featured his advice on hair, products, and hair maintenance. In addition, he has designed iconic looks for the red carpet, stage and screen. Having the desire to create a minimalist and chic hair care, Robert launched his own hair care line, Robert Ramos Products Inc., in 2008. After launching, Roberts Hair Products were on high demand with many of his clients and salons in NYC and LA. To see the full line, visit www.robertramos.com. Robert is an ambitious visionary who believes the secret to success and happiness is to remain true to self , which means creating innovative looks for the rest of his life!